Prior to its official launch on June 20, OnePlus 5 has already attracted over 75,000 Chinese consumers who have registered their information at online shopping site JD.com to get a chance to participate in the flash sale happening on the 22nd of June. OnePlus' CEO, Pete Lau, claims that the handset is going to be the slimmest flagship available in the market, creating more buzz and anticipation. The OnePlus 5 is expected to sport a 5.5-inch Full HD display, powered by a Qualcomm Snapdragon 835 octa-core chipset that is clocked at 2.45GHz with Adreno 540 GPU, 8GB of RAM and 128GB of internal storage. At the back of the device, it is rumored to have a dual camera setup (most likely a 16MP + 20MP combo). The battery will have a 3300mAh capacity with Dash Charge for rapid charging and it is expected to run on Android 7.1.1 Nougat OS. 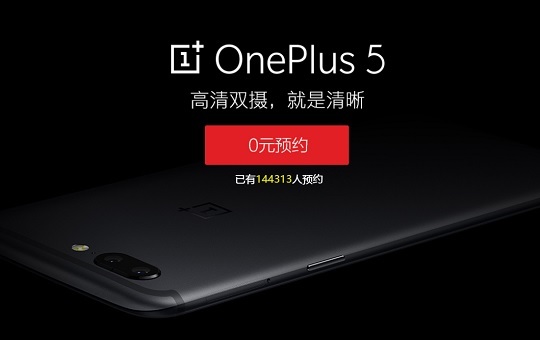 The OnePlus 5 will be unveiled globally on June 20 and will be available for purchase in China two days after at a price possibly starting at USD479 or about Php24K.